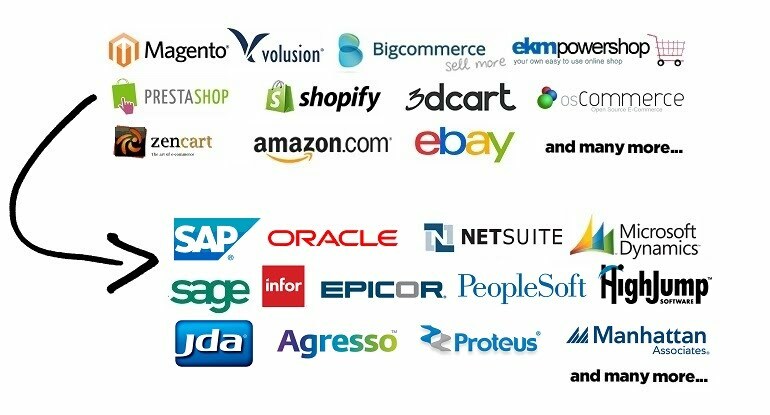 Integrate your Online Ecommerce Applications, Webstores and Platforms to Warehousing, Back-Office, Transportation and 3PL Systems. Convert from Magento, Amazon AWS, Volusion, XCart, Bigcommerce, Shopify, EKM Powershop and other Webstores into required EDI Messages in UN/Edifact, ANSI X12 and Tradcoms. The majority of traditional Business-to-Business (B2B) operations have adopted Electronic Data Interchange (EDI) as a means of establishing ‘trading partner relationships’ with Suppliers. EDI messages are exchanged between trading partners in various standards ranging from Edifact, Tradacoms, ANSI X12, VDA, UPU, HL7 and HIPPA. The transmission of messages typically takes place over FTP, SFTP,AS2/AS3, HTTPS or Value Added Network (VAN ). A rapid expansion of online retailing by businesses has meant that new requirements to interface existing EDI operations with online operations (Webstores, Transactional Websites and Marketplaces) is mandatory. However there is major key difference between the B2B and B2C operation within the ecommerce supply chain; that of Standards. Within B2C (Online Commerce) there is no single set of unified standards. Each Platform, Webstore and Marketplace dictate their own Mandatory and Optional requirements, Structure and Data format, whilst in B2B all transactions are Standards driven by Message Type, Version and Message Implementation Guideline (MIG). To successfully integrate B2C and B2B operations, online data formats must be transformed into the correct validated EDI message types that can be transmitted through the existing infrastructure to trading partners for fulfilment. In the e-commerce supply chain a webstore or transactional website provides sales orders in CSV, XML or JSON that are transformed into an EDI purchase order and sent via Direct EDI, VAN, AS2/AS3 or HTTPS to the supplier. Supplier's fulfil orders and sends advanced ship notices (ASN's) to the retailer's fulfilment centre or dropship the item directly to the customer. Once dispatched the supplier then sends an EDI invoice to the retailer requesting payment. Below shows typical online platforms, webstores and marketplaces that require custom EDI integration. Transforming Data provides a Cloud based EDI /Data Transformation solution that is effective for Retailers who exchange a few messages a day and powerful enough for those who handle thousands every hour. Choose the streamlined approach to integrate your B2C messages with your existing B2B EDI infrastructure.